Assistant Professor Alec Jacobson has received the Eurographics Young Researcher Award 2017. The Young Researcher Award is given each year to two young researchers in the field who have already made a significant contribution. Jacobson joined the Department of Computer Science in the Dynamic Graphics Project (DGP) lab as assistant professor in the summer of 2017. Jacobson’s research applies to geometric methods and improving the user experience. It’s a very tedious process, says Jacobson, to animate a 3D character where the artist has to painstakingly set the poses of the character for each frame, or every few frames. A few seconds of film might require hours and hours of work. “The work I have done in the past has been to reduce the workload of the individual artist. And this culminates in some new and exciting ways of controlling characters,” he says. You may have seen Donald Trump’s appearance on "The Late Show" – but only cartoon form. These animated appearances have been made possible through Jacobson’s research being incorporated into Adobe's character animator software. “Real-time character animation, almost like puppeteering, is the kind of thing our research is enabling, that couldn’t be done in the past,” says Jacobson. Jacobson finished his PhD at ETH Zürich in 2013, under the supervision of Olga Sorkine-Hornung and received the 2014 Euro graphics Annual Award for the Best PhD Thesis. He was also the 2014 Heidelberg Laureate Forum Young Researcher and was as nominated as a US Junior Oberwolfach Fellow in 2015. 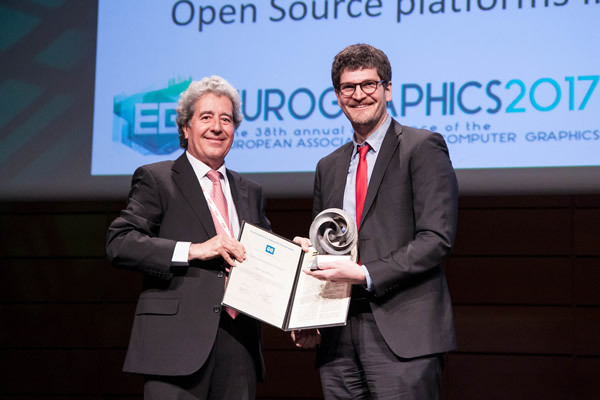 He received the 2015 Eurographics/ACM Symposium on Geometry Processing Software Award for his work and leadership in the "libigl" project, a popular Open Source platform for Geometry Processing algorithms. He has published five ACM Transactions on Graphics (TOG) papers (Siggraph and Siggraph Asia) in 2014 and 2015 and three Siggraph papers in 2016.